Liczba stron: 204 Jest to ujednolicona liczba stron, która ułatwi Ci porównanie długości książek. Każda strona Legimi to 200 słów. It was eight o’clock in the morning—the time when the officers, the local officials, and the visitors usually took their morning dip in the sea after the hot, stifling night, and then went into the pavilion to drink tea or coffee. Ivan Andreitch Laevsky, a thin, fair young man of twenty-eight, wearing the cap of a clerk in the Ministry of Finance and with slippers on his feet, coming down to bathe, found a number of acquaintances on the beach, and among them his friend Samoylenko, the army doctor. With his big cropped head, short neck, his red face, his big nose, his shaggy black eyebrows and grey whiskers, his stout puffy figure and his hoarse military bass, this Samoylenko made on every newcomer the unpleasant impression of a gruff bully; but two or three days after making his acquaintance, one began to think his face extraordinarily good-natured, kind, and even handsome. In spite of his clumsiness and rough manner, he was a peaceable man, of infinite kindliness and goodness of heart, always ready to be of use. He was on familiar terms with every one in the town, lent every one money, doctored every one, made matches, patched up quarrels, arranged picnics at which he cooked shashlik and an awfully good soup of grey mullets. He was always looking after other people’s affairs and trying to interest some one on their behalf, and was always delighted about something. The general opinion about him was that he was without faults of character. He had only two weaknesses: he was ashamed of his own good nature, and tried to disguise it by a surly expression and an assumed gruffness; and he liked his assistants and his soldiers to call him “Your Excellency,” although he was only a civil councillor. It was Laevsky’s habit as he talked to gaze attentively at the pink palms of his hands, to bite his nails, or to pinch his cuffs. And he did so now. “Yes, if the disease is not neglected. 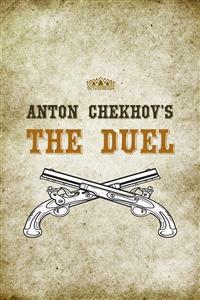 Cold douches, blisters. . . .
“Why is it my duty?” Laevsky asked irritably. “Vanya, Vanya!” said Samoylenko, overcome with confusion. “No, no . . .” the doctor cried in dismay, clutching Laevsky’s arm. “It is for me to pay. I ordered it. Make it out to me,” he cried to Mustapha. Laevsky’s not loving Nadyezhda Fyodorovna showed itself chiefly in the fact that everything she said or did seemed to him a lie, or equivalent to a lie, and everything he read against women and love seemed to him to apply perfectly to himself, to Nadyezhda Fyodorovna and her husband. When he returned home, she was sitting at the window, dressed and with her hair done, and with a preoccupied face was drinking coffee and turning over the leaves of a fat magazine; and he thought the drinking of coffee was not such a remarkable event that she need put on a preoccupied expression over it, and that she had been wasting her time doing her hair in a fashionable style, as there was no one here to attract and no need to be attractive. And in the magazine he saw nothing but falsity. He thought she had dressed and done her hair so as to look handsomer, and was reading in order to seem clever. “Will it be all right for me to go to bathe to-day?” she said. “Run away,” he muttered to himself, sitting up and biting his nails.